A Corporate Accountant is responsible for analyzing data, managing financial reporting, budgeting, and forecasting, the corporate accountant oversees the accounting procedures of the company and ensures that it abides by the company’s rules and regulations. Apart from maintaining the financial records, the corporate accountant has to work upon various other accounting and financial arenas. The other core jobs duties include – preparation of financial statements and drafting budgets for fund allocation. Most of the employers look out for a Bachelor’s degree in finance or Corporate Accounting to qualify for the post of a corporate accounting, there are so many corporate accountant job opportunities, but these will be handed over to the Corporate Accountant Resume sample that projects extraordinary assets like – leadership, organizational skill, robust communicative trait and keen eye for detail. Summary : Corporate Accountant with 16 years of experience in the Manufacturing domain is seeking to acquire a challenging position in an organization that will utilize my skills and educational training while offering me an opportunity for professional growth. Monitoring the daily cash flows and accounts receivable posting through BTMU innovation system. Verifying the coding of accounts payable, approving the outgoing checks with the vendor's invoices, posting accounts payable ledger, approving the wire transfers, and issuing the #1099-misc forms. Checking and reviewing the payment request application forms which are submitted by the salespersons. Handling the monthly bank reconciliations, balance-sheet accounts reconciliations, and cash-flow reports. Maintaining the fixed assets depreciation schedule, chart of accounts, and short-term investment. In charge of G/L entries, month-end closing entries, accrual entries, adjusting entries, and year-end entries. Taking care and submitting the quarterly management reports, consolidation statements, and financial statements. Processing the employees payrolls (ADP) and 401k plans, maintaining the employees time sheets, keep track of employees benefit issues, and other payroll and human resources related issues. Preparing and filing yearly form 5500 (401k compliance data), quarterly and annual Commercial Rent Rax, Canadian GST tax, e-file the federal (EFTPS) and NYC/NYS quarterly estimated corporate taxes. Summary : Corporate Accountant with 18 years of experience in the Finance domain is seeking a full-time remote position in a professional accounting firm, to provide expert services where excellent analytical and technical skills can be utilized with dependable and reliable leadership. Providing senior-level accounting, financial analysis, reporting, and bookkeeping services to support the operations of all departments. Independently preparing the work-papers and adjusting the journal entries from the client's records to compile full-disclosure financial statements and/or tax return. Developing the cash forecast, reconciling the bank statements, and setting up new accounts as needed. Serving as the main point of contact for banking relationships. Preparing the monthly and quarterly consolidated financials and compilations. Professional use of creative solutions-Thomson Reuters, ATX professional tax software, MS Word, MS Excel, QuickBooks. Compiling the information for and prepared quarterly/annual taxes, including federal and state taxes. Preparing and transmitting the consolidated quarterly estimated tax payments. Unlimited client representation rights on any matters including audits, payment/collection issues, and appeals. Incorporating the clients, which includes, articles of incorporation, minutes, and by-laws, stock certificates, SS-4 form and Michigan registration. Handling the client interviews one-on-one for individuals and all corporate tax returns. Performing all bookkeeping functions which include accounting, payroll services, quarterly payroll taxes, financial statements and monthly reconciliations. Partnering with the Assistant Treasurer to recover overpaid state taxes, conducting a thorough internal audit of past returns that identified problems. 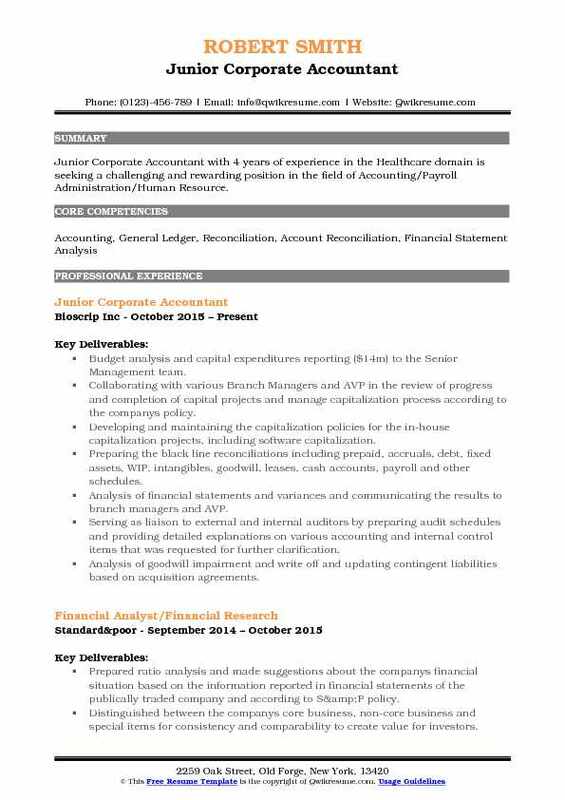 Summary : Corporate Accountant with 14 plus years of experience in the Healthcare domain is seeking to secure an accounting position with a well-established company that will utilize my education, skills, and experience, as well as provides growth opportunities and challenges. Preparing and submitting the quarterly general services administration contract. Maintaining the listing of fixed assets for 4 divisions and process asset transfers, disposals, and general ledger reconciliation. Final review and approval of weekly accounts payable batches for 3 divisions and invoicing for 2 divisions. Posting the accounts receivable batches and sales posting batches to the general ledger. Processing the employee health insurance enrollments, changes, and termination paperwork. Submission of employee and employer health savings account contributions. Responsible for receiving inventory into the system, facilitating the monthly physical inventory counts, identifying discrepancies, as well as month end reconciliation of inventory to the general ledger. Responsible for the calculation, accrual, and submission of payment for license agreement royalties. Responsible for the calculation, accrual, and submission for approval of employee sales commissions. 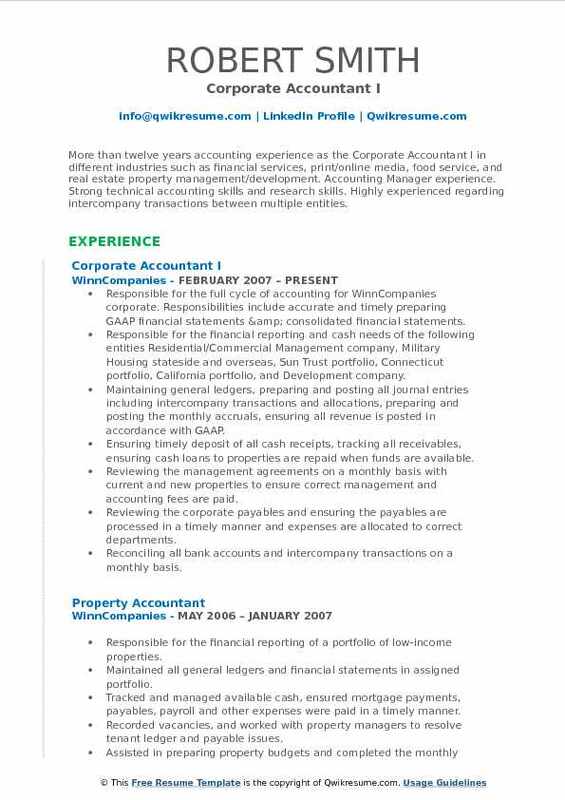 Summary : More than twelve years accounting experience as the Corporate Accountant I in different industries such as financial services, print/online media, food service, and real estate property management/development. 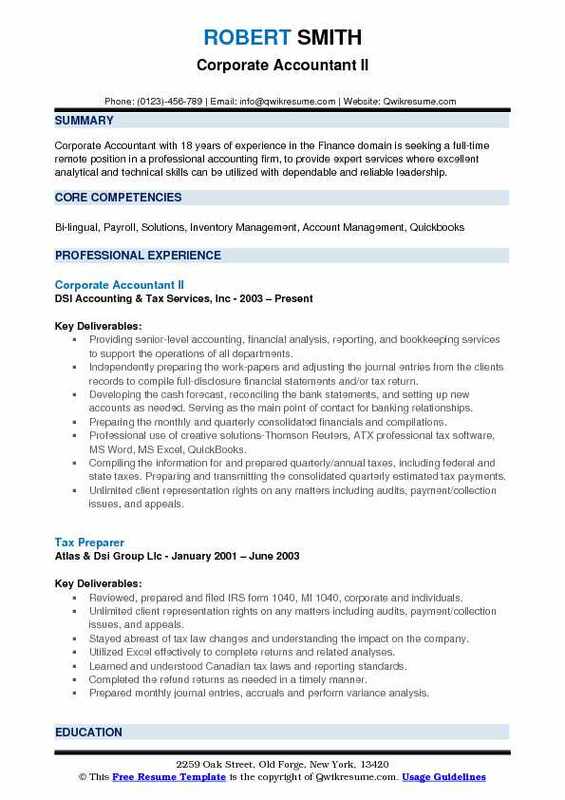 Accounting Manager experience. 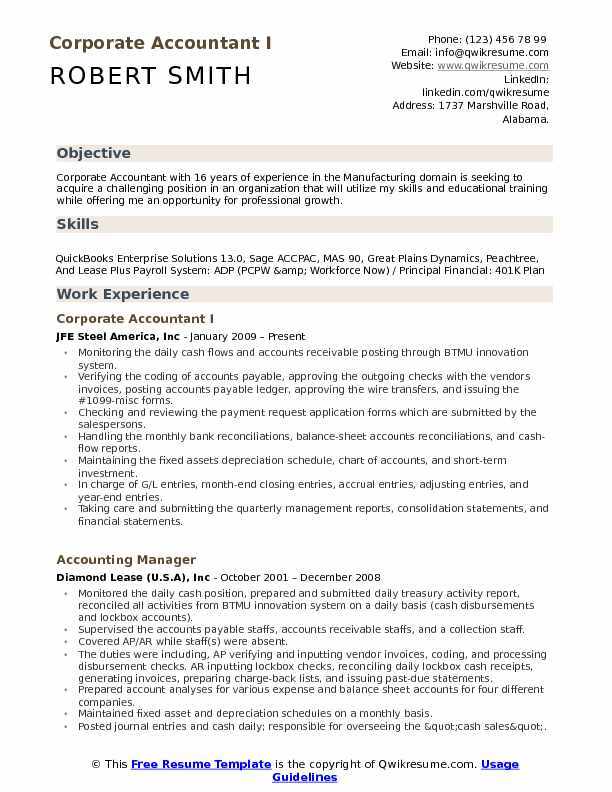 Strong technical accounting skills and research skills. Highly experienced regarding intercompany transactions between multiple entities. 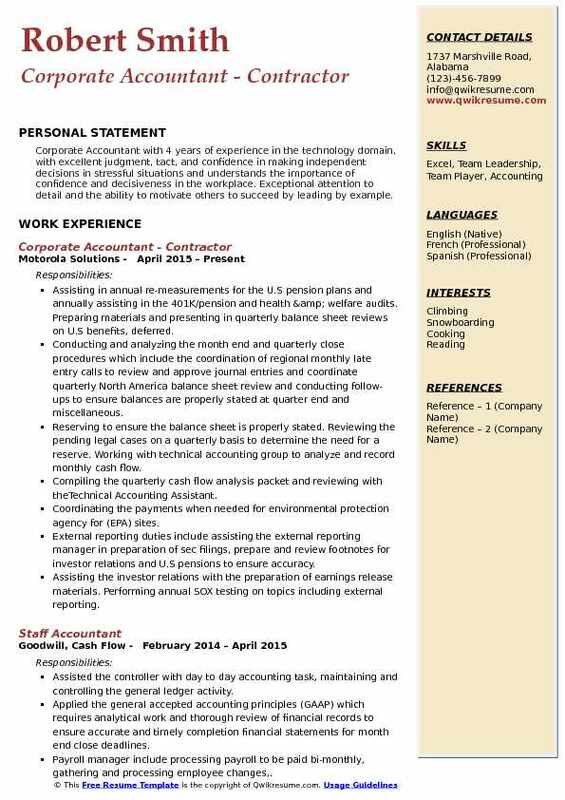 Skills : Yardi 6.0, Yardi 7.0 (Segmented Accounting), Lawson, Great Plains, HomedIn, Meal Soft, ACCPAC, MAS-200, Brain Works, Multi-Pub, Pay Scan, Check Scan, Bloomberg Terminal, Kwiktag, Excel. Responsible for the full cycle of accounting for WinnCompanies corporate. 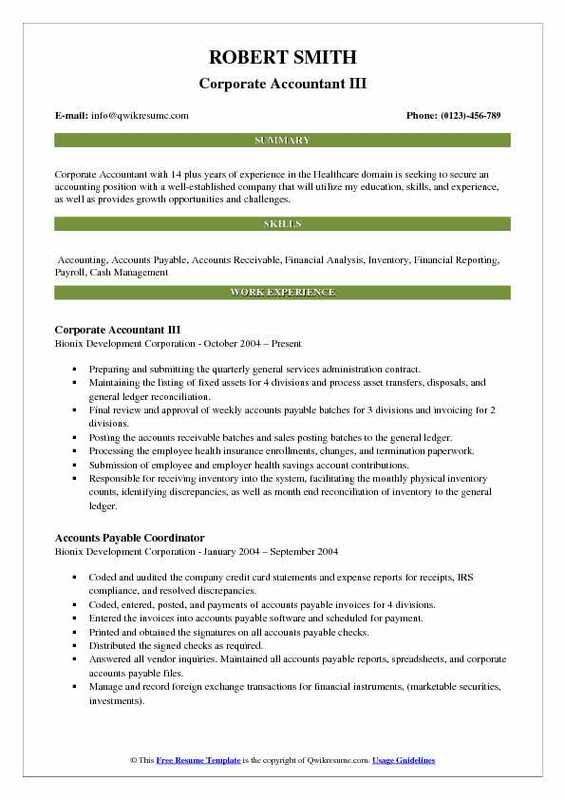 Responsibilities include accurate and timely preparing GAAP financial statements & consolidated financial statements. Responsible for the financial reporting and cash needs of the following entities: Residential/Commercial Management company, Military Housing stateside and overseas, Sun Trust portfolio, Connecticut portfolio, California portfolio, and Development company. Maintaining general ledgers, preparing and posting all journal entries including intercompany transactions and allocations, preparing and posting the monthly accruals, ensuring all revenue is posted in accordance with GAAP. Ensuring timely deposit of all cash receipts, tracking all receivables, ensuring cash loans to properties are repaid when funds are available. Reviewing the management agreements on a monthly basis with current and new properties to ensure correct management and accounting fees are paid. Reviewing the corporate payables and ensuring the payables are processed in a timely manner and expenses are allocated to correct departments. Reconciling all bank accounts and intercompany transactions on a monthly basis. Preparing the monthly budget re-projections. Assisting in finalizing the original budget for the year. Performing the month-end close, reviewing equity for accuracy, and reviewing financials with the VP of Accounting and Chief Financial Officer. Preparing and posting all year-end adjusting entries and accruals, assembling the work papers for auditors, responding to all inquiries and requests from auditors and tax preparers. Summary : I have been in the accounting filed in all jobs that I have had, the last being 23 years with the same company. The job dealt mainly with Family Office Operations to include Corporations, Partnerships and Trust entities. In addition I preformed Executive Assistant duties for my Supervisor. Responsible for keeping 100+ sets of books to include all aspects of accounting. Handled all incoming and outgoing wires, often in excess of millions. Made sure all invoices, note payments, bank transfers etc. were paid properly. Handled confidential matters for members of the family and provided the financial information to them. Set up bank/investment accounts when new entities were created. Created numerous spreadsheets that listed all balance sheet accounts for each entity with a summary page to ensure all A/P, A/R, N/P, N/R, investment & equity accounts match. This spreadsheet listed monthly flow of all cash and expenses between different companies and the reason for the transfers, since the money came in and out of numerous acts. Maintained spreadsheets to ensure the accuracy of all outside investments, kept track of cash basis. Used this document as a backup to enter journal entries on a monthly basis. Prepared month end journal entries, accruals, account reconciliations, reviewed the general ledger trial balances at the month end, and financial statement preparation. Summary : A detailed orientated Corporate Accountant II with 15 plus years of experience in the Finance domain is seeking a position with growth opportunities in Accounting. Assisted with the preparation of the monthly, quarterly and year-end financial statements and close process. Responsible for the timely and accurate preparation and execution of monthly journal entries along with corresponding balance sheet reconciliations. Maintained the detailed cash receipts scheduled and prepared and distributed the daily cash position to the Senior management. Conducted Month over Month and Actual vs. Budget variance analyses and reported on specific trends to the Senior management. 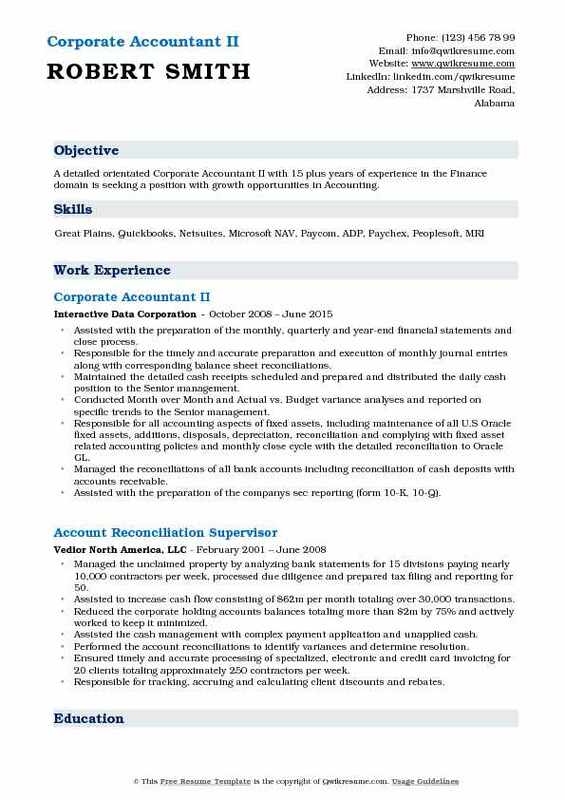 Responsible for all accounting aspects of fixed assets, including maintenance of all U.S Oracle fixed assets, additions, disposals, depreciation, reconciliation and complying with fixed asset related accounting policies and monthly close cycle with the detailed reconciliation to Oracle GL. Managed the reconciliations of all bank accounts including reconciliation of cash deposits with accounts receivable. Assisted with the preparation of the company's sec reporting (form 10-K, 10-Q). Reviewed the purchase orders and invoices to ensure they adhere to company's capitalization policy and assist with expense account coding. Coordinated the monthly financials and analysis for three legal entities with cash balances totaling $10m, including journal entries, accruals, prepaid, financials and account reconciliations. Participated in the Oracle upgrade and part of the company test team responsible for the Oracle FA and cash management requirements ensuring test results are accurate and documented. Co-ordinated the annual fixed asset physical inventory with other IDC groups including facilities managers, accounting managers, and divisional controllers. Assisted with both external and internal audits, foreign reconciliation reviews and Ad hoc projects as needed. 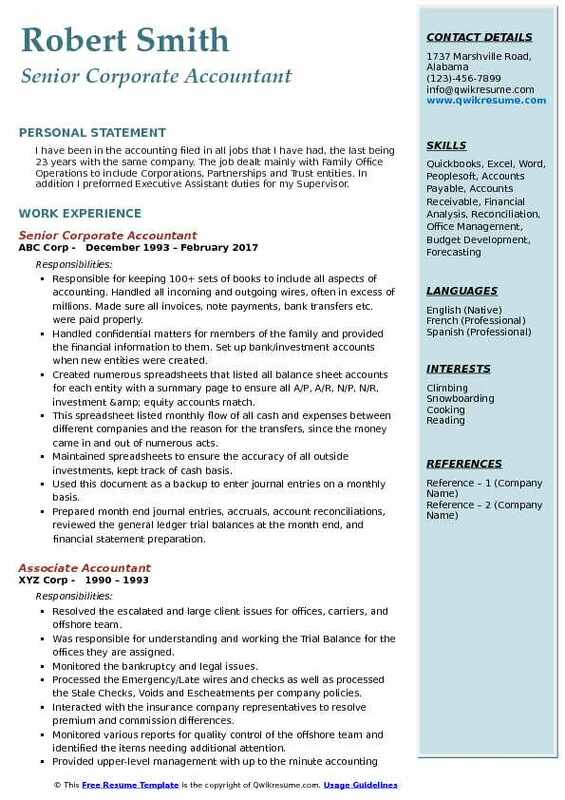 Summary : Senior Corporate Accountant with 7 plus years of experience in the Finance domain is seeking for a position allowing me the opportunity to work in a complex accounting, audit, and taxation organization which will provide me with diverse challenges and the ability to utilize my accounting, business, organizational, and communication skills. Responsible for the accounting controls of twelve partners plans and a 40+ group of accounts within a given specialized area. Analyzing a complex financial data, extracts, and cost-side forecasting experience with budgets exceeding $35 million. Interpreting data for the purpose of determining past financial performance and/or to project a financial probability. Recording, classifying and summarizing the financial transactions and events in accordance with generally accepted accounting principles. Performing cost allocations and journal entries in accordance with internal procedures and generate the financial summary reports. Completing $2. 8 million account reconciliations of a complex nature with established due dates that produces reports for cost behavior, trends, variances, and other pertinent information applicable to the line of business. Expediting a high dollar amount of recovery accounts to increase the productivity of operational performance metrics reported to senior management and other subsidiaries. Analyzing $3 million of related aged summary reports and reduced the accounts by implementing systematic changes to improve the monthly refund receivable summary reports. Developing and implementing the process improvements into the management plan reports to include testing, tracking shortfalls, addressing reoccurrence of issues, monitoring reciprocation in the workflow, and re-examining the action plans. Providing guidance, assistance and support to the staff members and internal/external auditors prior to, during, and after completion of the interim and year-end audits. Attending the monthly team meetings to assess finance issues, quality control results, internal audit findings, and trends across the jurisdiction of the accounting departments. Objective : Junior Corporate Accountant with 4 years of experience in the Healthcare domain is seeking a challenging and rewarding position in the field of Accounting/Payroll Administration/Human Resource. Budget analysis and capital expenditures reporting ($14m) to the Senior Management team. Collaborating with various Branch Managers and AVP in the review of progress and completion of capital projects and manage capitalization process according to the company's policy. Developing and maintaining the capitalization policies for the in-house capitalization projects, including software capitalization. Preparing the black line reconciliations including prepaid, accruals, debt, fixed assets, WIP, intangibles, goodwill, leases, cash accounts, payroll and other schedules. Analysis of financial statements and variances and communicating the results to branch managers and AVP. Serving as liaison to external and internal auditors by preparing audit schedules and providing detailed explanations on various accounting and internal control items that was requested for further clarification. Analysis of goodwill impairment and write off and updating contingent liabilities based on acquisition agreements. Updating the special charges, legal expenses, and interest income and expenses schedules; prepare and file personal property taxes. Preparing various Ad hoc reporting for the Senior Management team and lead and support different projects assigned by the Director of Accounting. Managing the corporate and infusion company's fixed assets and related depreciation and other schedules and reports, including inventory reconciliations at year-end to ensure SOX compliance. Analyzing and verifying the information by developing advanced Excel spreadsheet reports. 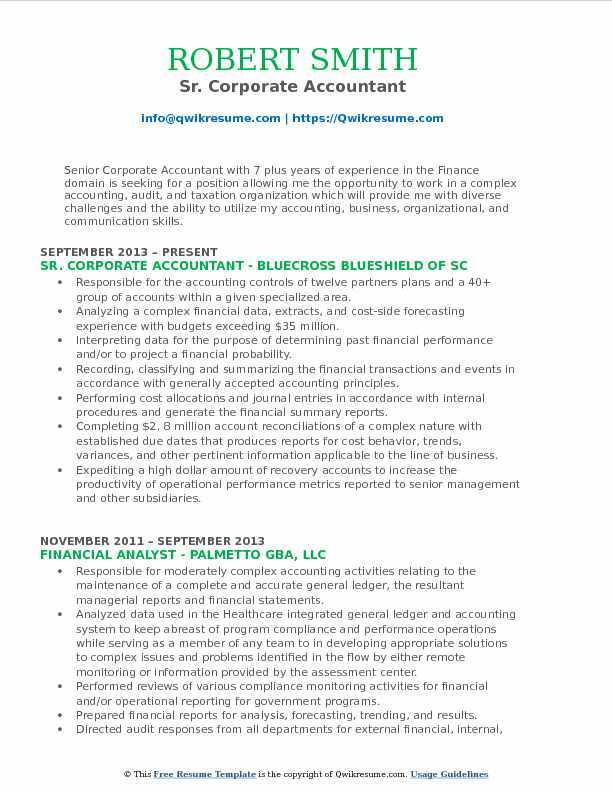 Objective : Corporate Accountant with 4 years of experience in the technology domain, with excellent judgment, tact, and confidence in making independent decisions in stressful situations and understands the importance of confidence and decisiveness in the workplace. Exceptional attention to detail and the ability to motivate others to succeed by leading by example. Assisting in annual re-measurements for the U.S pension plans and annually assisting in the 401K/pension and health & welfare audits. Preparing materials and presenting in quarterly balance sheet reviews on U.S benefits, deferred. Conducting and analyzing the month end and quarterly close procedures which include the coordination of regional monthly late entry calls to review and approve journal entries and coordinate quarterly North America balance sheet review and conducting follow-ups to ensure balances are properly stated at quarter end and miscellaneous. Reserving to ensure the balance sheet is properly stated. Reviewing the pending legal cases on a quarterly basis to determine the need for a reserve. Working with technical accounting group to analyze and record monthly cash flow. Compiling the quarterly cash flow analysis packet and reviewing with theTechnical Accounting Assistant. Coordinating the payments when needed for environmental protection agency for (EPA) sites. External reporting duties include assisting the external reporting manager in preparation of sec filings, prepare and review footnotes for investor relations and U.S pensions to ensure accuracy. Assisting the investor relations with the preparation of earnings release materials. Performing annual SOX testing on topics including external reporting. 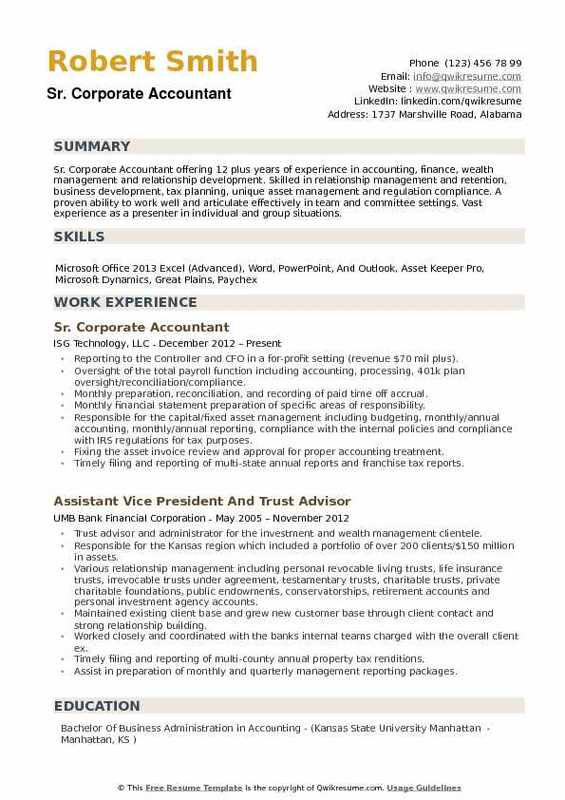 Summary : Sr. Corporate Accountant offering 12 plus years of experience in accounting, finance, wealth management and relationship development. Skilled in relationship management and retention, business development, tax planning, unique asset management and regulation compliance. A proven ability to work well and articulate effectively in team and committee settings. Vast experience as a presenter in individual and group situations. Reporting to the Controller and CFO in a for-profit setting (revenue $70 mil plus). Oversight of the total payroll function including accounting, processing, 401k plan oversight/reconciliation/compliance. Monthly preparation, reconciliation, and recording of paid time off accrual. Monthly financial statement preparation of specific areas of responsibility. Responsible for the capital/fixed asset management including budgeting, monthly/annual accounting, monthly/annual reporting, compliance with the internal policies and compliance with IRS regulations for tax purposes. Fixing the asset invoice review and approval for proper accounting treatment. Timely filing and reporting of multi-state annual reports and franchise tax reports. Management of multi-state sales and use tax reporting, filing, and compliance. Special projects, analysis, and reporting as requested by the Controller and CFO including annual budget and periodic forecasting analysis.